27-year old head brewer Alex Arkell has been keeping himself busy in the run up to his wedding later this month to long-time sweetheart Alice Braithwaite. 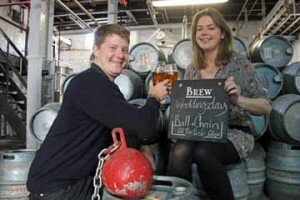 While Alice is kept frantically busy organising the wedding, which is taking place at her family home in Northumberland on 26 January, alongside running her successful Lechlade teashop, The Tea Chest, which opened last year, her groom Alex has been creating the perfect celebratory beer for the occasion at the Swindon brewery, which he’s named (with Alice’s approval) Ball and Chain Ale. rtant day of our lives,” said Alex. Alex says that the ingredients of his traditional ale are the same as that of a successful marriage. “Beer is brewed from malt, hops, water and yeast. ermentation. Marry them together and there you have it: Malt and hops for content, stability and flavouring and yeast to rise to the occasion. This entry was posted in Press Releases and tagged Arkell, Arkells, Beer, Braithwaite, Northumberland, Nuptuals, Real Ale, Swndon, Wedding. Bookmark the permalink.